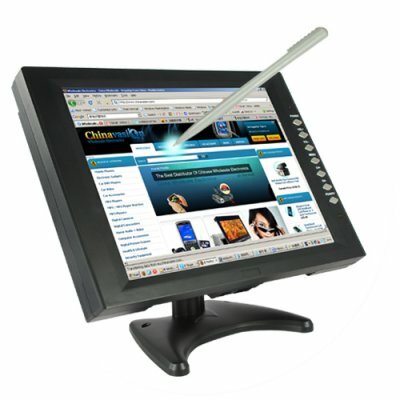 Successfully Added 12 Inch LCD Touch Screen Monitor for Computers, TV + DVD Player to your Shopping Cart. 12 inch touch screen LCD monitor for Computers, TV and DVD Player. You've seen the 8 inch LCD touch screen monitor, now BEHOLD the 12 inch LCD touch screen monitor. Finally we are presented with a Large monitor that can be used as a primary desktop monitor with full touch screen functionality. With VGA and S-Video to AV input, you can be sure to get the most out of this high performing touch screen monitor. Thanks to its 12" screen size, you can use your finger or the stylus comfortably. This unit provides great functionality and versatility in its use. So go ahead and install it in your car and make all your friends jealous. In addition, you can also have a two monitor system installed, which makes using your computer fun and lets you be more productive. Use the CVSF-E30 with either your surveillance cameras, computer or TV. This awesome 12" LCD touch screen monitor is nothing short of technological creativity, with careful design and engineering with the user in mind. The CVSF-E30 touch screen monitor makes a wonderful addition to your editing suite or work desk. This model also comes with an adjustable stand which makes it great if you want to mount it on the wall. You can even mount the LCD monitor on the wall with out the adjustable stand if you do not need the LCD monitor to be versatile. Be up to date with the next big thing in car and home entertainment, and get it from Chinavasion at awesome wholesale prices for your personal/company use, resale market, online/physical store along with a 12 month warranty, and is available to you from the leader in direct wholesale electronics, Chinavasion. 12 inch LCD for use in your car or on your desk. Get full touch screen control of your computer. Can this LCD touch screen monitor be used for film making purposes? Yes, this 12 inch LCD touch screen monitor is the perfect tool for location and studio filming. It provides flexible viewing in a size that is easy to mount on top of cameras or hold in your hands. Can I use touch control on other electronic devices with the CVSF-E30? No, the touch control can only be used on a computer, as for other electronic devices, you can use the CVSF-E30 as an extra monitor.